Produced using solid core polymer plastic, the unique nature of the material's surface empowers the designer to create contrasts of texture by applying glossy varnish to selected areas. Many of our competitors have chosen to automate the printing process. To do so, the blank plastic card has to be gripped on at least two sides as it passes through their automated printing equipment. This prevents them from printing to the edge of the card. We have chosen a different path. We take pride in the handcrafted nature of our product. Each card is aligned and printed using traditional techniques. Our choice to avoid automation means we can run rings around the limitations of more automated suppliers, including printing to the very edge if required. As well as standard pigment inks, we can apply stunning metallic inks to the plastic. Our range of metallic colours are vibrant and highly reflective, the ever popular silver being almost chrome-like. We even stock a diffraction ink that spreads the white light hitting its surface into the colours of the spectrum. 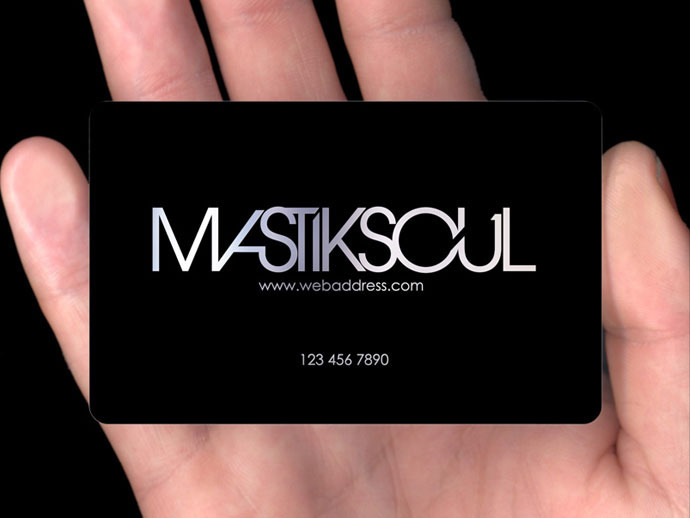 Each satin business card comes with a luxurious matt finish to its surface. By using gloss inks, it’s possible to create contrasting textures between printed and unprinted areas. Doing so is not only eye-catching but interestingly tactile too. Our satin plastic cards are available in a rich black or a pristine white. Both options are 760 micron thick and have solid cores, matching the surface colour. We often incorporate a rich black glossy ink. This creates a subtle and interesting contrast between surface textures.